Pioneers in the industry, we offer uv vis microprocessor spectrophotometer and spectrophotometers device from India. We are one of the trusted suppliers and traders of Spectrophotometer UV - Vis Microprocessor – Indian. These are used to measure the absorbance levels, percentage transmission and the concentration levels in the liquids. Known for high accuracy and reliable measurements, these are demanded widely by our wide spread clients. Complete mirror optics with resolution 1200 Grooves / mm grating. Power AC:220V + 10%, 50 Hz. 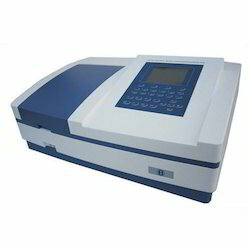 We have firmly positioned itself as one of the dominant spectrophotometer manufacturers and exporters from India. The Spectrophotometers are manufactured from the optimum quality raw materials under strict quality control measures. We have ready stock of Spectrophotometers and offer them within the stipulated time frame and that too at very competitive prices. We are accomplished leading manufacturers and suppliers of an engineered range of Micro Processor UV-VIS Spectrophotometers. Our products are known for their durability, versatility, uggedness, easy operations, longer lives and perfect accuracy in determining absorbance, % transmission and concentration of liquid. 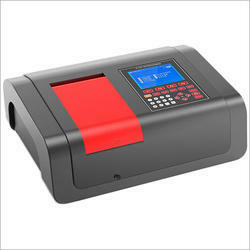 Looking for Spectrophotometer UV Vis Microprocessor Indian ?